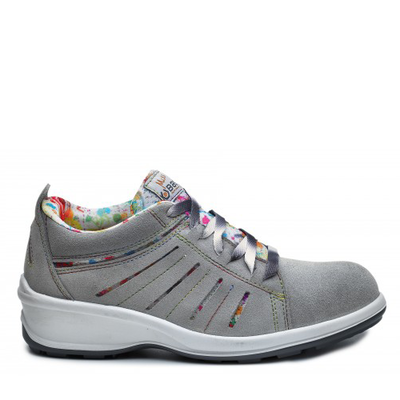 The Base Claire is a durable shoe, lightweight, stylish and provide the highest standard of comfort. Foot injuries at workplaces are very common and it may come in any shape and size. This is why wearing safety shoes or boots with toe caps is essential as it will protect your feet from mishaps. The Base Claire has a steel top cap that will protect your feet from heavy falling objects when working. The outer toe cap of this shoe has TPU (Thermoplastic Polyurethane) this provides your shoe with improved slip resistance. This non-slip shoe will stand up to tough working conditions with durability. These shoes have a patented ventilation system which uses the foots natural movement as a pump to circulate cool air down through holes in the inner sole of the shoe and along specially designed airways before being expelled. This means that air circulates freely around the shoe and any moisture in the shoe is absorbed and expelled by the cool air. As a result it prevents feet from becoming sweaty and other associated conditions such as athletes foot.